Peppermint Grove | Curious about Peppermint Grove…we are here to help! Did you know that Manners Hill Park was once a 6 hole golf course? Originally this land formed part of the larger Keane (Edward Keane) property and was used to pasture animals. The land was purchased by the government in 1899 prior to Keane’s death. It was a popular camping spot before becoming the home for golf in Peppermint Grove. In 1902 the newly established Cottesloe Grove Golf Club opened a six-hole course on the then state managed reserve. The course was particularly popular with women, newly introduced to the sport. The Road Board then spent significant funds on the land and named it Manners Hill Park after J. Manners Hill who was first elected to the Road Board in 1916 and later became its chairman. He held this position for 24 years. Born in Perth, Western Australia and educated at Hale School in Wembly Downs, Anthony Boyd Craig has led a full and adventurous life. During his early career, Anthony was employed as a Costing Clerk at H. L. Brisbane & Wunderlich Ltd, the state’s largest clay tile producer, at North Street in the City. Anthony’s elementary training was in a Tigermoth and thus he qualified as a pilot and was awarded the Flying badge in April 1942. Anthony was then sent to the UK where, during 1943, he studied an advanced flying course and was trained to fly Lancaster Bombers. He remained stationed in the UK until 1945. Anthony quickly moved through the ranks achieving Pilot Officer in early 1943 and Flight Lieutenant mid 1944. Anthony requested to be released from his contract with the Air Force after the war. His request was granted in August, 1945. Anthony returned to Perth and married Sylvia in 1946 and moved to 22 Irvine Street, Peppermint Grove in 1955. He commenced serving the community of Peppermint Grove in 1956 when he stood for election to Council. Anthony served the Shire for 35 years, 16 of which he was Shire President. Anthony died in Jolimont at the grand age of 95. In 1891 distinguished colonist Edward Keane purchased land that included what was then known as ‘Butler’s Hump’, now Keane’s Point. By 1894, Edward had built their family home, Cappoquin House which they named after their home town in Ireland. Although his work as a civil engineer, builder and politician kept him extremely busy, Keane still found time to be an instrumental force in establishing the Freshwater Bay Boating Club at the foot of Irvine Street in December 1896. With government agreement, the Club, now known as The Royal Freshwater Bay Yacht Club, built a jetty out into the Bay with its own club house (look out for the plaque to mark the spot, next time you visit the bay). Keane died in 1904, and twelve years later his wife decided to subdivide their land into residential sites. The subdivision was suspended when an influential group united to purchase the land to keep it in public hands. In 1920, the land was leased to the Repatriation Department for Permanently Disabled Returned Soldiers, and Cappoquin became Anzac Hostel and accepted 14 patients. By 1928 numbers had reduced to just six patients who were transferred to Lucknow Hospital. The area subsequently became a popular camping ground before finally being leased, in 1936, to the Royal Freshwater Bay Yacht Club. The club has flourished and it remains a premier home for yachting in Western Australia. Nyoongar people have maintained a close connection with the Swan River – known to them as Derbal Yerrigan – for more than 40,000 years. This connection forms the basis for much of their cultural and spirituality identity. Freshwater Bay was an important camping place, a source of fresh water from springs, a fishing and trading area, and above all a spiritual place. The Nyoongar word for the bay itself Minderup – means place for alleviating sickness. Freshwater Bay, which from most angles resembles a great lake, has few peers along the river for sheer beauty. The beautiful homes capping the northern highlands bear witness to the loveliness of the scene. Then down the river, beaches have one great asset and charm not possessed by their northern sisters – the shady and graceful Peppermint tree. It was these native riverside Peppermint trees which inspired the name Peppermint Grove. The majestic Moreton Bay figs were planted here later – in the early twentieth century – and remain important for shade. At one time destroyed for camp fires, the trees are now appreciated and protected. Looking for some family outdoor fun this holiday. Pick up your free copy of Discover Peppermint Grove Activity sheet from the library and head off for some super sleuthing. Cottesloe and Mosman Park coming soon. In 1904 Andy Johnson, a Swedish sailor, established a business as ‘buyer and seller of all kinds of boats (rowing preferred)’. He lived in a houseboat moored at the foot of Leake Street until 1905 when he built and occupied the boatshed on this site. Once established, he began hiring rowing boats on the shore. He added tea rooms before selling his business in 1919 to James and Nellie McFarlane. Nelly was well known for her fruit cake and tea. Passengers from the boats on the river would stop off for cake and a swim. Nelly would put their false teeth into a paper bag for safe keeping! Nelly also supported the troops during World War II when the Royal Freshwater Bay Yacht Club was used as HMAS Leeuwin II. She would hold dances and play the piano and the soldiers would have a good sing-a-long. As late as the 1970s there was still no sewerage connection for the living accommodation, and waste waters went directly into the river. A succession of development plans were drawn up in the 1970s. 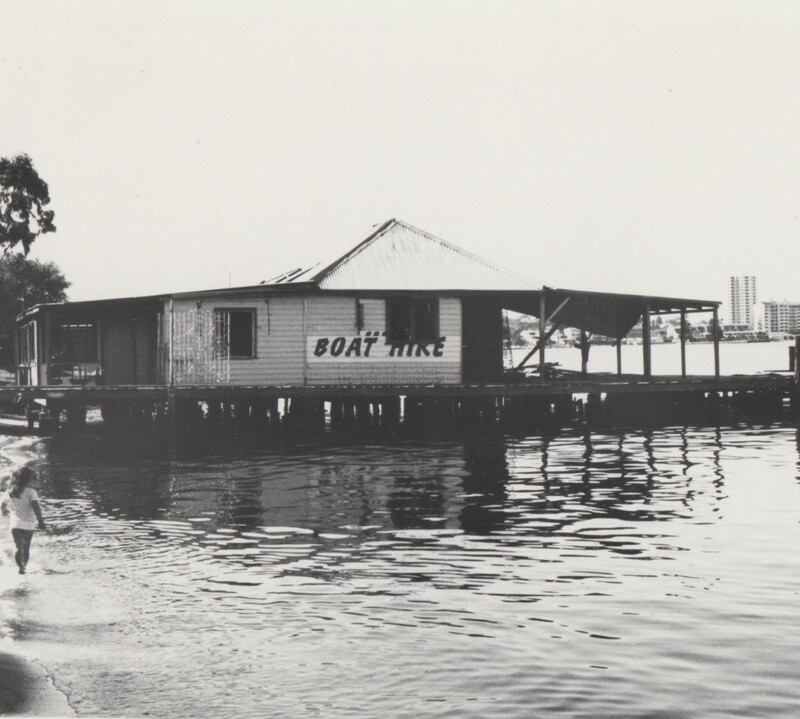 All plans were put on hold when in 1980 the recently renovated boatshed was demolished by fire. Further discussions on larger scale development took place but in 1999 the remaining jetty and landing were demolished.